Feeding your pet – excessively or just the wrong food? Yet another random press release arrived in my in box yesterday (I do get a lot of them…) This one was from Direct Pet Line Insurance about pet obesity! Apparently 43% of vets in the UK treated dogs or cats for obesity last year! 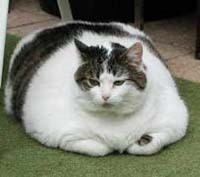 And 67% of those vets had seen an increase in the number of pets being treated for obesity over the last five years. It seems that 54% of these poor pets are being treated for orthopaedic conditions – mainly, I suspect, back problems as a result of carrying those sagging bellies. 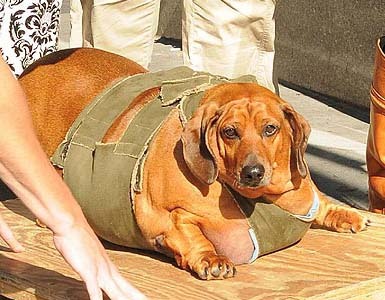 However, if you really want to see what owners can do to their pets, see the Mail on Line’s report from 2013 on Obie (pictured) who weighed 77lbs (a normal dachshund should weigh about 30 lbs) before his owners put him on a year long diet. 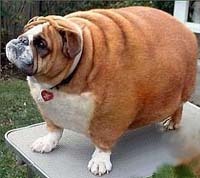 The US Association for Pet Obesity Prevention reckons that 52.6% of US dogs are overweight, verging on obese – this bulldog, featured on TopDog, presumably being among the latter group. And don’t think that cats are immune to this sort of abuse – even more of them are overweight/obese in the US – 57.6% of them – which seems even more bizarre as cats are perfectly able to regulate their food intake to what they need. Our cats have food permanently available (Royal Canin Dental for those who wish to know, specially designed so that they have to chew and remove tooth plaque rather than just swallowing… Sorry, too much information for so early in the morning…). They eat when they feel the need and stop when they have had enough. 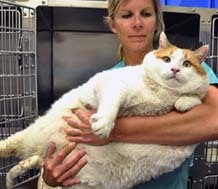 So how, unless it is force fed like a goose for foie gras, can a cat get to the size of Meow who had to be put to sleep aged two by the Santa Fe animal shelter because they could not get his weight off before he developed terminal health complications. Or this poor creature who must struggle even to get to his feet! However, whatever about these really shocking statistics, the press release did remind me that I had been meaning to do a little more investigation into food allergy/intolerance in animals – a subject which looms almost as large on the internet as does food allergy/intolerance in humans! So here goes. A browse around the many pet allergy sites on line (mainly run by pet food companies) suggests that around 10% of dog/cat sensitivities are food related; the other 90% are caused by either fleas or inhaled allergens. 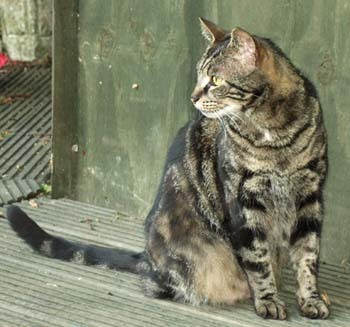 In cats over 50% of itching and scratching symptoms are caused by food sensitivity but the other 50% could be caused by flea bites, internal parasites or bacterial infections so it is important to rule all of them out before you assume that the problem is food based. As with humans the sensitivity can either be an immune related, immediate onset ‘allergy’ (although I did not come across any reference to a full blown anaphylactic reaction) or an ‘intolerance’. Symptoms of allergy seem mainly to be dermatological (itching, scratching, hair loss through excess grooming, inflammation); symptoms of intolerance, gastrointestinal (vomiting, diarrhoea etc). Food allergens can include anything that the animal eats very regularly and allergies can develop at any age. The most common allergens seem to be wheat/gluten, dairy products, soya, corn, beef, lamb and seafood – probably not surprisingly as, although they are the most common ingredients to be found in pet food, none of the them would have been found in a dog or cat’s diet in the wild. And as with humans, blood and skin prick tests can be used to diagnose, although not very convincingly. But, be warned, allergy testing costs can escalate rapidly. I was quoted up to £1400 for the tests need to identify one of our cat’s possible allergies. Antihistamines and, in the worse cases, steroids can be helpful to control the reactions but, as with humans, by the far the best approach is an elimination and challenge diet, first to identify the allergen, and then to manage it. However, while an elimination and challenge diet may be a pain for humans, it is perfectly do-able – but you try telling your dog or cat, ‘Sorry, mate – no more treats, chews or bits of discarded goodness knows what that your found under the tree in the park on your last walk….’ Since, as with all elimination diets, you need to stick to it rigorously, the only way that you could really achieve this with a dog or cat is to keep them permanently locked up and never allowed out at all. Well, fine for a house cat but the vast majority of domestic pets expect to go out on a regular basis, either with their owners or under their own steam, so they will not take kindly to this option – especially since most of the sites recommend that the elimination diet be stuck to for 12 weeks before a challenge is attempted! My own experience with cat allergy (our tabby, Mushkin, had a bad dose of it about a year ago) was to give up on the tests and go down the homeopathic route. This was not cheap either (£180 for an initial visit and £80 for follow ups) but did seem to achieve some relief. He does now appear to have completely recovered but that was only after he was treated not only with the homeopathic remedy by us, but given a hypo-allergenic feed and rubbed with herbal lotions by our neighbours who he has adopted and with whom he now spends most of his time, and given a tiny dose of amitriptyline by us to ‘calm his nerves’! Which one of these various treatments it was that finally did the job, we really do not know! None of which is very helpful to any of you who happen to have a dog or a cat who you fear may have a food allergy. I suspect that the best bet is to change their diet to eliminate the most obvious allergens and hope that reducing the amount of their particular trigger that they are eating may be enough lower their sensitivity. Certainly for most pets, locking them up for 12 weeks would not only reduce their owners to nervous wrecks but would induce all kinds of horrendous symptoms in them out of pure frustration! And then maybe add a few antihistamines, and some homeopathic or herbal remedies to the diet…. Good luck! !